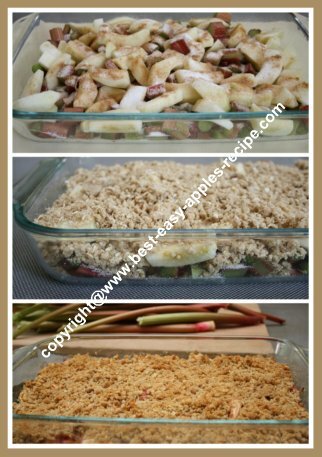 I absolutely love ♥ making this easy Rhubarb Apple Crumble Recipe. The oatmeal topping on this crumble dessert is the preferred type of topping for our family. This is a great fall, (autumn), recipe, when the apples are ripe, and you still have a final rhubarb harvest to gather. Or, make this recipe at ANY time of the year and use frozen rhubarb and frozen apples! 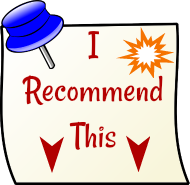 I made this recipe this past weekend, and, as usual it was a big hit! No one ever seems to tire of a warm fruit crumble for dessert time or for snack time! 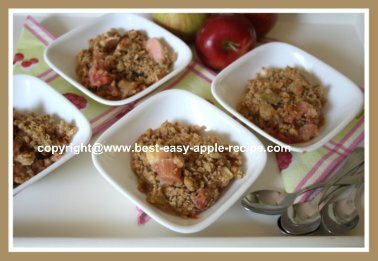 Serve this apple rhubarb crumble warm, fresh from the oven, or cooled plain, or with a dollop of whipped cream or vanilla ice cream ... so yummy! 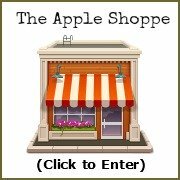 Almost any type of apple works for crumble recipes. If you don't have rhubarb, you can still use this great crumble recipe, and substitute another fruit in the place of the rhubarb. Try peaches, pears, berries, or apricots. I usually make a double batch of the "topping" every time I make a fruit crumble, and store it in the fridge for up to several days. Then, whenever I wish to make a crumble for the family, I just arrange the fruit in a baking dish, add the topping, and I have a scrumptious dessert or snack ready in minutes! Now, let's get baking this Rhubarb Apple Crumble! You do not need to thaw the apples if you are using frozen apples. In a bowl, combine the flours, oats, brown sugar, salt and the pecans, and combine with a fork. Add the cold butter pieces, and, using your fingers, mix in the butter, until the mixture resembles coarse crumbs. Set the crumble topping aside. Add the chopped rhubarb and the sliced apples to a greased, (I used cooking spray), 9" x 13" oven safe, baking dish. Sprinkle the apples and rhubarb in the baking dish with the sugar, flour and cinnamon mixture, and toss to coat. Sprinkle the oatmeal crumble topping over the fruit in the baking dish. 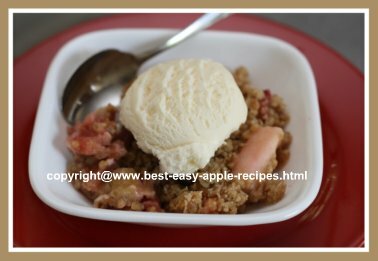 Serve this scrumptious rhubarb apple crumble warm or at room temperature with ice cream, whipped cream, whipped dessert topping, or a spoon of Greek yogurt. Visit my other website, rhubarb central, a website devoted to only rhubarb recipes!